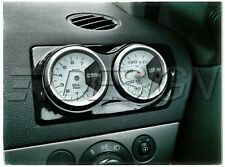 Opel Astra H MK5 Driver Double Air Vent Gauge Holder. This part replaces the driver side air vent. Gauge not included. Holes are made to fit two 52mm gauges (boost, oil pressure, water temperature, ect). Model: ASTRA G MK4 1998-2003, ASTRA COUPE 1998-2003. The plastic surrounds or the gear knob is not included. Make: VAUXHALL / OPEL. ASTRA COUPE 2000-2005. Leather Colour: Black. Stitching Colour:Black. And what you will receive is only the leather part. BMW E46 1999-2004. black leather with M3///. FORD MODEO MK4 2007 . And what you will receive is only the leather part. Black leather with red stitching. Top quality gear gaiter made from 100% genuine Italian leather. The plastic surrounds or the gear knob is not included. Make: VAUXHALL / OPEL. Model: CORSA B C 1993-2005. COMBO 1994-2010. Leather Colour: Black. Gear leaver gaiter handbrake gaiter hi-low transfer leaver. gaiter made from 100% genuine Italian leather. LAND ROVER DISCOVERY (1996-1998) OR (1999-2004) TDI TD5 200 300. And what you will receive is only the leather part. Vauxhall Astra G MK4 Air Vent Single Gauge Holder. existing driver side air vent on a RHD car. Holes are made to fit a52mm Gauge (boost, oil pressure, water temp, ect). Inc GSI SRI SXI - Black Gloss. VAUXHALL ASTRA MK5 H (2004-2009) GENUINE LEATHER GEAR & HANDBRAKE GAITER. PLASCTIC SURROUNDS / GEAR KNOB / HAND BREAK LEAVER - NOT INCLUDED. 100% GENUINE ITALIAN LEATHER. BLACK LEATHER. PERFECT FIT - ONLY FOR CAR LISTED AS ABOVE. Box contains: 1 x Gear Gaiter. VAUXHALL CORSA C (2000-2006). Leather Colour: Black. We specialize in customisation of car interior but also in creating unique and personalized products made of genuine leather or suede material. FITS FORD FIESTA MK6 FUSION 2002-2008. Model: MONDEO Mk4 (2007-2013) only. Top quality gear gaiter made from 100% genuine Italian leather. The plastic surrounds or the gear knob is not included. Leather Colour: Black. Stitching Colour: Black. FITS ALL MINI COOPER CLASSIC. Black leather with red stitching. 12v Car Cigarette lighter kit cig socket auxiliary aux. UNIVERSAL Illuminous Car Cigarette Lighter with socket NEW SEALED. · Universal Fit. Designed to mount 1 x 52mm gauge in each vent and can be used in either of the centre vents. 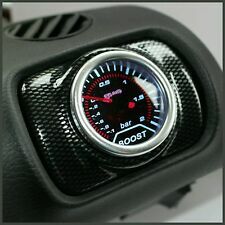 Corsa D Vent Gauge Holder- Gloss Black ABS. Here I have PAIR of Gloss Black ABS plastic heater vent gauge holder adapter panels. Stitching Colour: Red "SXI" Embroidery. Box contains: 1 x Gear Gaiter 1 x Handbrake Gaiter. VAUXHALL CORSA C (2000-2006). We specialize in customisation of car interior but also in creating unique and personalized products made of genuine leather or suede material. The plastic surrounds or the gear knob is not included. Make: VAUXHALL / OPEL. Model: CORSA C 2000-2006, COMBO 2001-2006. Leather Colour: Black. Stitching Colour:Black. Top quality set gear gaiters handbake made from 100% genuine Italian leather. FORD MONDEO MK4 (2007-2013). Box contains: 1 x Gear Gaiter. We specialize in customisation of car interior but also in creating unique and personalized products made of genuine leather or suede material. VAUXHALL / OPEL CORSA C (2000-2006) GENUINE LEATHER GEAR & HANDBRAKE GAITER. PLASCTIC SURROUNDS / GEAR KNOB / HAND BREAK LEAVER - NOT INCLUDED. BLACK LEATHER. 100% GENUINE ITALIAN LEATHER. BLUE STITCHING. FITS VAUXHALL OPEL ZAFIRA C 2012-2014. And what you will receive is only the leather part. 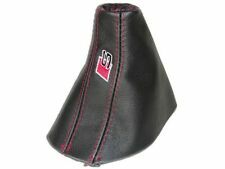 BLACK LEATHER GEAR GAITER SHIFT BOOT. This leather gaiter will improve the appearance making, your gear shift look like new again. VW Golf MK 5 2003 - 2008. The plastic surrounds or the gear knob is not included. Make: VAUXHALL / OPEL. Model: CORSA C 2000-2006, COMBO 2001-2006. Leather Colour: Black. Stitching Colour:Blue. Top quality set gear gaiters handbake made from 100% genuine Italian leather. T5 Sunglasses Holder. Will Also fit many other models just check before you buy. Helpful Links. 5 Minutes To Fit (very easy). 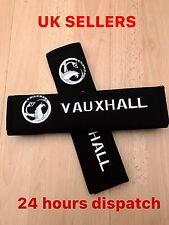 VW T5 T5.1 Transporter Caravelle Sunglasses Holder Brand New OEM Quality..
VOLKSWAGEN T5 TRANSPORTER SUNGLASSES HOLDER GREAT ADDITION TO YOUR T5 FITS VW TRANSPORTER 2003 ONWARDS. PLUS VW CADDY 2k 2004 ONWARD FACELIFT. WILL FIT OTHER VW MODELS JUST CHECK BEFORE YOU BUY. Fits all mini variants from 2001 to 2006. Set of 6 which is enough for both doors. FORD S-MAX & GALAXY MK3 2006 . And what you will receive is only the leather part. Black leather with black stitching. Model: CADDY MK3 2K 2003 - Present, Touran 1 2003 - 2009. Top quality gear gaiter made from 100% genuine Italian leather. The plastic surrounds or the gear knob is not included. Leather Colour: Black. Top quality gear gaiter made from 100% genuine Italian leather. CORSA C 2001-06. Stitching Colour:Black. Leather Colour:Black. The plastic surrounds or the gear knob is not included. Opel Astra H MK5 Driver Single Air Vent Gauge Holder. This part replaces the driver side air vent. Holes are made to fit a 52mm gauge (boost, oil pressure, water temperature, ect). Gauge not included . GAITER CAR. 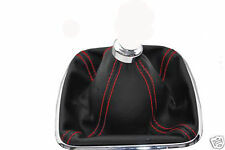 100% black quality eco leather shift knob gaiter. VECTRA( may not fit vectra C). Suitable for the following models. Box contains: 1 x Gear Gaiter. FIAT 500(2007-2015). Stitching Colour: Red "500" Embroidery. Leather Colour: Black. We specialize in customisation of car interior but also in creating unique and personalized products made of genuine leather or suede material. 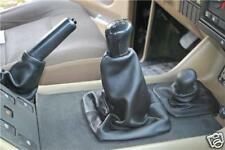 VAUXHALL / OPEL CORSA C (2000-2006) GENUINE LEATHER GEAR & HANDBRAKE GAITER. PLASCTIC SURROUNDS / GEAR KNOB / HAND BREAK LEAVER - NOT INCLUDED. 100% GENUINE ITALIAN LEATHER. BLACK LEATHER. PERFECT FIT - ONLY FOR CAR LISTED AS ABOVE. CITROEN BERLINGO MK2 ( 2008-2016 ). Box contains: 1 x Gear Gaiter. The gear knob itself or plastic surround are NOT included. We specialize in customisation of car interior but also in creating unique and personalized products made of genuine leather or suede material. 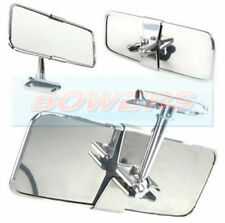 STAINLESS STEEL REAR VIEW MIRROR. Adjustable flat glass mirror. 155mm x 64mm Mirror head. Universal 2 screw fitting (screws supplied). Can be dashboard mounted stood up or screen mounted hang down. 39mm Between screw holes (centre of hole - centre of hole). To fit Vauxhall Vectra MK2 C 2002 ->. 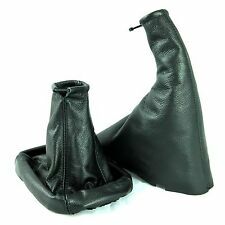 BLACK GENUINE LEATHER GEAR GAITER SHIFT BOOT. This leather gaiter will improve the appearance making, your gear shift look like new again. The gear knob and plastic surround is not included, you will receive only the leather part. FITS VW GOLF MK2 1982-1991.